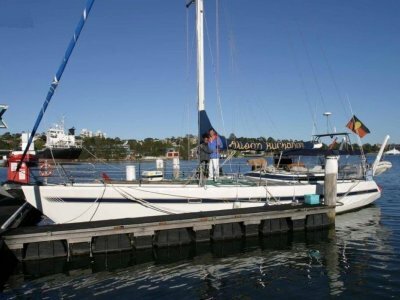 OPPORTUNITY - REAL VALUE - BARGAIN BASEMENT PRICE 60 FT YACHT SET UP FOR RACING CAN BE USED FOR CRUISING COMES WITH ALL THE SAFETY GEAR REQUIRED EXTENSIVE SAIL INVENTORY . 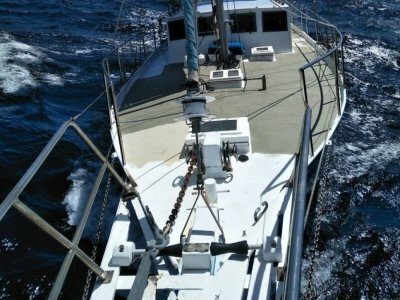 . .
CRUISE IN SAFETY AND COMFORT IN THIS BEATIFULL ROUND BILGE STEEL BOAT. 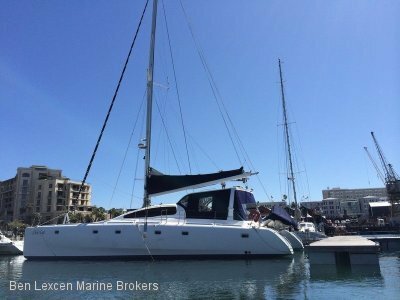 THE PERFECT BOAT TO CRUISE ON AROUND AUSTRALIA, AROUND WORLD OR JUST LIVE ON AS A LUXURY HOLIDAY APARTMENT THAT HAS THE WORLD AS . 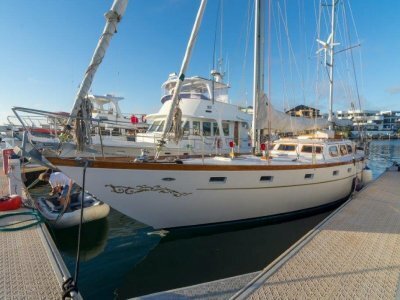 . .
SCHOONER RIGGED 60 BUILT BY THE LEGENDARY SOUTHERN OCEAN YACHTS IN POOLE EXTEREMELY ROBUST AND BUILT FOR EXPEDITION WORK IN TOUGH, HARSH AND REMOTE ENVIRONMENTS 5 CABINS - 2 PER BERTHS IN EACH . . . VESSEL WILL BE ON HARDSTAND FOR EASY INSPECTION - AN ULTRA SOUND, SURVEY AND CONDITION REPORT IS AVAILABLE UPON REQUEST 53' Custom Roberts with a 59' length overall, launched in 2003, . . .
A BIG CATAMARAN BUILT FOR CRUISING IN LUXURY AND STYLE ENOUGH FUEL CAPACITY FOR A RANGE OF 700 nm DRIVEN BY 2 x 150hp YANMAR DIESELS ALONE EASY TO SAIL SHORTHANDED DUE TO CONTROLS LINES LEADING . . . 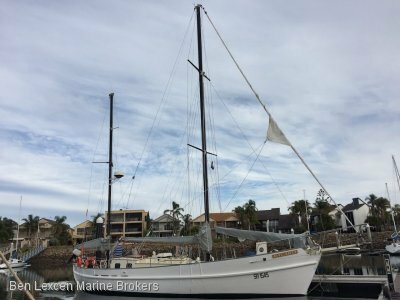 ROUND BILGE LONG KEEL KETCH IN BEAUTIFUL CONDITION - 50 FT ON DECK - 57 FT INC BOWSPRIT PERFECT BOAT FOR LONG DISTANCE CRUISING OR JUST LIVE ABOARD CARVEL CONSTRUCTION OF SPOTTED GUM 40mm THICK . . .
BEN LEXCEN - DESIGNER OF AUSTRALIA II OF THE AMERICAS CUP CHALLENGE FAME. AUSTRALIA II ENDED THE LONGEST WINNING STREAK (132 YEARS) IN HISTORY OF SAILING SPORT PACEMAKER WAS DESIGNED BY BEN . . . Extremely comfortable and capable craft. 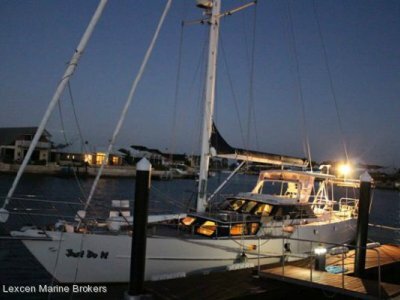 Custom built to 2C Survey in Fremantle Western Australia this Design No. 85 Mk 4 Cursing Cat. 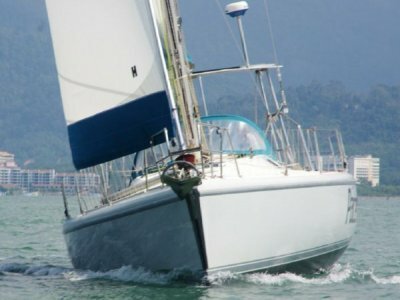 She went up to Hong Kong when first completed in 2002 and back . 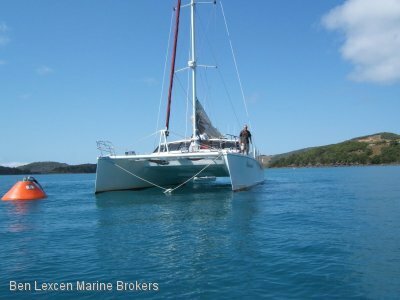 . .
CLASSIC BLUE WATER SAILING BOAT IN IMMACULATE CONDITION THE PERFECT KETCH FOR EXTENDED CRUISING OR LIVING ABOARD EASILY SAILED BY SINGLE PERSON 7 FT HEAD ROOM 3 CABIN LAYOUT ONLY 1500 HRS ON THE . 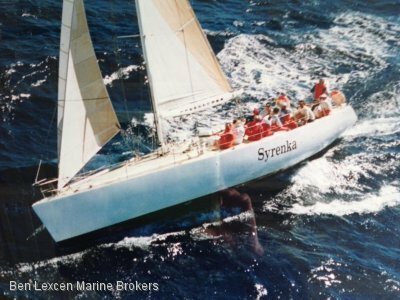 . .
FOR PRIVATE OR COMMERCIAL USE In current survey - 30 passangers inshore 1D 14 passangers offshore 2B UNDER POWER 7-8 KNOTS UNDER SAIL EASILY REACHES 12 KNOTS STATEROOMS (2 FORWARD . 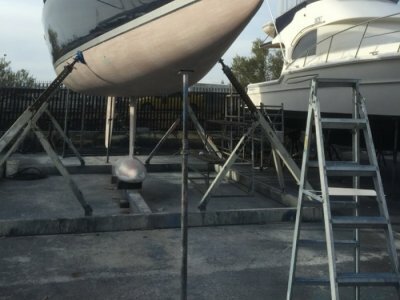 . .
49' MARTEN YACHT LAUNCHED IN 2008. 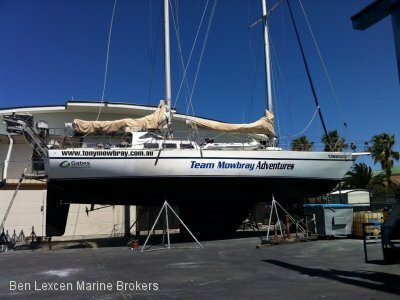 WITH THE HULL, DECK AND BULKHEADS MADE FROM CARBON FIBRE AND FOAM SANDWICH CONSTRUCTION FOR MAXIMUM STRENGTH YET MINIMUM WEIGHT. A FAST AND COMFORTABLE . 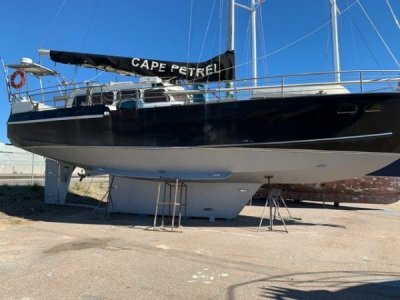 . .
48' STEEL VAN DE STADT - AUSTRALIAN REGISTERED SHIP RELAUNCHED DECEMBER 2015 AFTER MAJOR REFURBISHMENT AND FURTHER IMPROVEMENTS MADE IN JUNE 2017 INCLUDING NEW WINDOWS AND CLEARS. ROOMY . . . 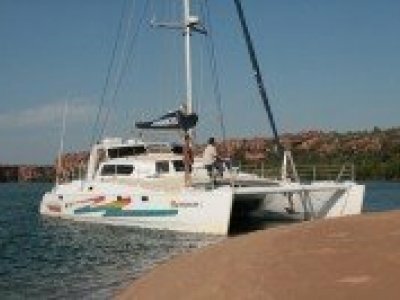 BUILT FOR CRUISING THE OCEANS AMPLE ACCOMMODATION 95 HP GARDNER ENGINE - FULLY RECONDITIONED ALL TIMBER IS SOUND NO RUST IN STEEL ISUZU 3 CYL 7.5 KVa GENERATOR STERN TUBE FILLED WITH . . . 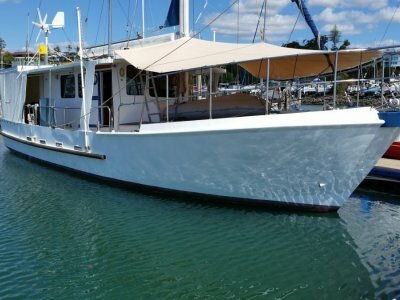 DESIGNED FOR BLUE WATER CRUISING BY HOLMAN & PYE (BRITISH NAVAL ARCHITECT) 80HP CUMMINS DIESEL WITH VERY LOW HOURS AUSTRALIAN REGISTERED SHIP . 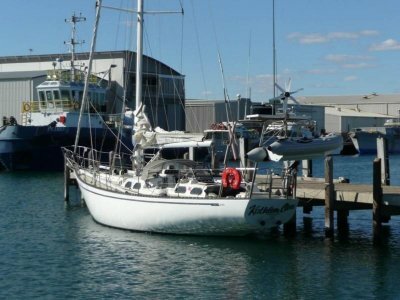 . .
BLUE WATER PILOT HOUSE KETCH GARDNER DIESELS TO SHAFT DRIVE AMPLE ACCOMODATION FOR LONG DISTANCE CRUISING 3 CABINS . . .